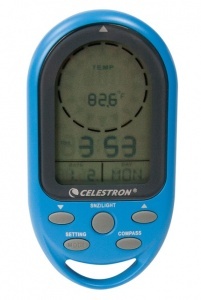 The Celestron TrekGuide Lite Digital Compass is compact and easily portable - a very useful and powerful tool for hiking trips and outdoor adventures. With built-in digital compass, date and time, temperature measurement, calendar, alarm and thermometer, the Celestron TrekGuide Digital Compass is a versatile product to carry. Unit conversion is available in all options to make the Celestron TrekGuide Digital Compass more flexible to use. All functions are displayed on a grey scale LCD screen that has a selectable backlight. A large range of temperature is provided that facilitates the user to work from sea level up to high altitude mountain tops. The digital compass provides degree, north pointing arrow and cardinal point readings with a range of 0° To 359° and 1-16 graphical points. The clock has alarm alerts for calendar. The compass is very light in weight (70g) and powered by two CR2032 batteries (supplied).